The precious weeks between the harvest season and hard freezes are the time to get your garden all tucked up and ready for winter, and begin preparations to make the next growing season a success. Remove crop residues from garden plots. 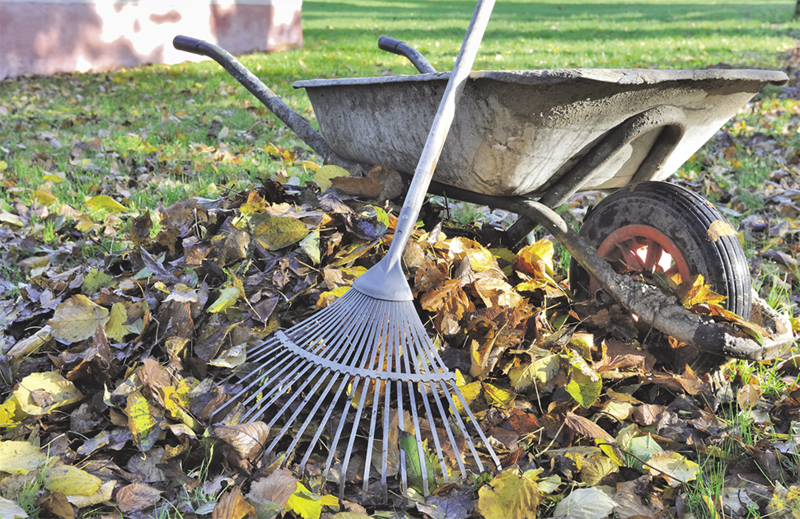 Most dead leaves, stalks and other leftovers can go into the compost pile to be recycled. Removing this debris helps to prevent disease and keep insect pests, such as root maggots, from over-wintering and returning. Mark perennials for spring. A marked stake can help you remember what's supposed to emerge where next spring. Apply mulch. Mulch provides a protective, insulating layer around sensitive perennials. A good mulch conserves moisture, reduces erosion and leaching, prevents rapid temperature fluctuations, and improves soil structure after it is incorporated. (Avoid mulches, such as grass or leaves, which may encourage rodents to overwinter in the perennials. Spruce branches and wood chips may work better.) Come spring, remember to remove the mulch. Till and turn heavy or compacted soils, then add organics. This allows faster drainage and warming in the spring. More organic material may be added next spring when you prepare the soil for planting. Dig in a top dressing of compost for raised or deep beds. This increases drainage, improves physical structure, and adds nutrients. Material should be well composted to avoid introducing weed seeds and other pests. Put away hoses and sprinklers. Drain them completely, and check for cracks or other damage. Store in a sheltered location where they will be safe from snow, snow shovels and other potential hazards. Keep evergreen and deciduous shrubs well watered before the ground freezes. Plants can get thirsty even during dormancy, but watering well will keep them from drying out over the winter. The combination of frozen ground, lack of water and winter wind can result in damage from drying, or winter kill. Timing is key, because watering won't work after the ground freezes. Carry out any garden expansion plans. Fall is usually a time when plants are idling down, which means a window of opportunity for projects. Test soil in the new garden area to determine fertility and liming requirements. This may be a good time to construct raised beds and improve the soil for their use. Plant bulbs. Soil should be well drained. Fall planting allows time for root development so that the bulb can produce and push forth leaf growth as soon as spring soil conditions allow. Mulch to prevent temperature extremes. Remove the mulch in spring to speed soil warming. "Winterize" perennials. Water; prune to remove dead, damaged or diseased parts; mulch to spread insulation over the root area; and wrap thin bark trees to prevent damage by winter sun and rodents. You may also want to divide and replant crowded perennials. Prune roses, raspberries, currants, gooseberries and other berry bushes. Remove old non-bearing canes, thin overgrown areas, prune and remove any damaged, dead or diseased parts. Remove branches that are too close to the ground. Head back canes or branches that have grown too long. Have frost covers ready for shrubs and any crops that are still in the ground. An early frost can damage garden crops and perennials that have not had time to prepare for dormancy. Damage from a light frost can be prevented by frost covers, but a hard freeze will probably result in extensive garden damage. Possible frost covers include plastic milk jugs, newspapers, plastic sheeting, bed sheets, paper bags, fiberglass sheets or panes of glass.